Striving for a flat left wrist at impact in a golf swing is given undue and misleading emphasis in general instruction based on a misconception that elite players consciously produce that circumstance as an essential component of effective swing technique. Such manipulation, leading into impact, tends to retard body rotation and the free swing through of the arms resulting in club head deceleration and a variety of miscued shots. A flat or bowed left wrist in the golf swing can sometimes be observed in high speed photo snapshots of elite golfers at the instant of impact when kinetic energy is transferred to the ball, more or less instantaneously, resulting in a sudden loss of club head speed while the arms and hands continue to move forward. This causes the leading wrist to involuntarily flatten or bow out towards the target momentarily as illustrated in the frame series and video below. The club head lags the hands in the downswing but is in line with them immediately before impact. At impact the club head speed is reduced while the hands jump ahead with flattening of the wrist. 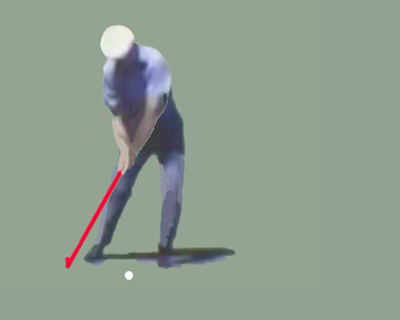 The club head begins to overtake the hands immediately after impact. Use the play/pause button to manipulate the action in the above video. The frames below show four master golfers sweeping through impact. In the first three frames the club head is in line with the hands immediately before impact with the wrists essentially in the same setting as they were at address. In the fourth frame the hands have jumped ahead at the moment of absolute impact. The sudden slowing of the club head and flattening or bowing of the left wrist is accentuated when a divot is taken in the playing of an iron shot particularly with the ball set back towards the right foot. 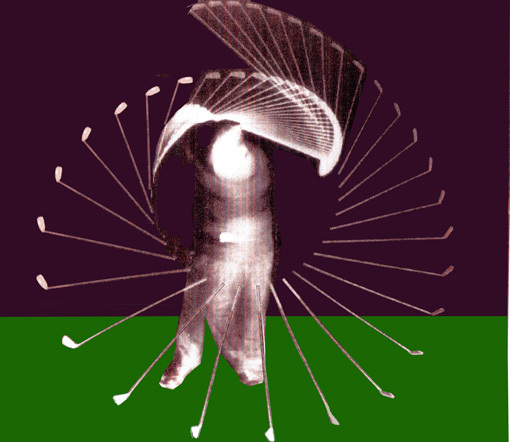 The next illustration is of the famous stroboscopic rendition of legendary master golfer Bobby Jones' downswing, sweep-thru-impact and follow-thru. The increasing gap width between the club head images in each strobe phase down to just prior to impact indicates acceleration. However the reduced gap in the actual impact phase and those thereafter indicates loss of club head speed. The next illustration is of the strobe phases in the impact zone showing the club's actual position just after impact in black and as it would have been if acceleration had continued in the absence of a ball shown in yellow. The difference in gap width to the black and yellow positions from the previous phase indicates the loss of club head speed at 20 to 25 percent. The angle between the black and yellow positions is reflected in momentary flattening or bowing of the left wrist towards the target. There is no evidence of hands manipulation or retarded club head acceleration in Bobby Jones' golf swing technique. Providing that the club gripping formation is appropriate and with proper wrist cocking and forearm action; the club head will lag naturally behind the hands in the downswing and into the start of the sweep-thru-impact. However with continuing unimpeded acceleration associated with the proper sweeping action there is catch-up towards impact with a distinct sensation of the club head actually passing the hands through impact without wrist flipping. Flattening or bowing of the left wrist will just be an unnoticed momentary consequential occurrence in the passing. Flattening of the left wrist at the top of the backswing can also be observed in the techniques of a large percentage of elite golfers. That matter is discussed at The Flat Left Wrist in the Golf Swing (downswing) with explanation as to why a flat left wrist at the top of the backswing needs to be modified in the downswing. For a full discussion on important aspects of the golf swing (Basic concept, Dynamics, Weight shift, Rotation, etc.) go to A New Insight into the Golf Swing .